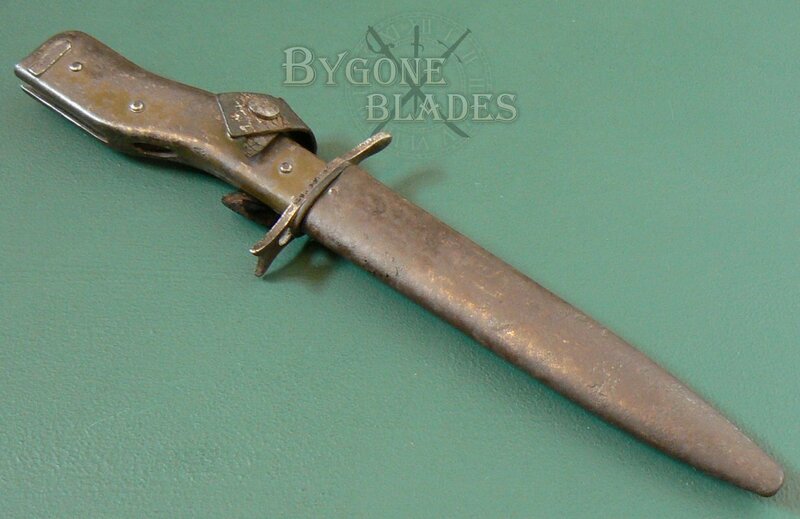 A rare and genuine early example of the famous ersatz (EB1) Crank Handle bayonet. 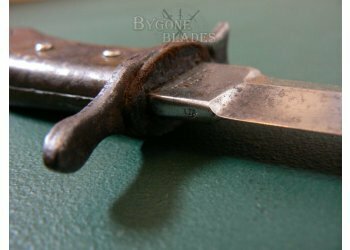 This is one of the few ersatz bayonets for which a maker is attributable. 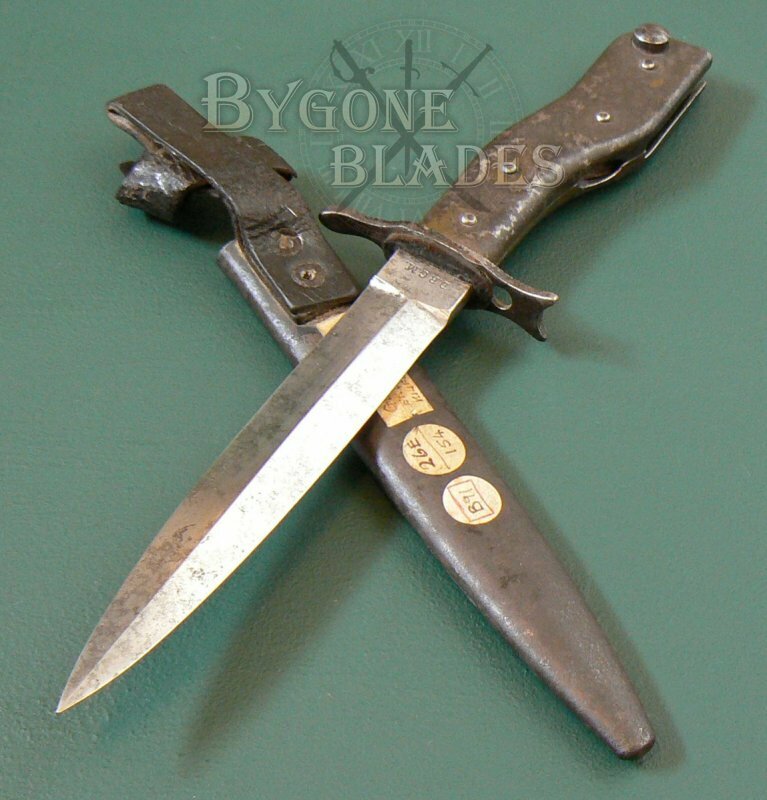 Deutsch Maschienenfabrik AG (DEMAG), Duisburg produced these bayonets between 1915 and 1918. 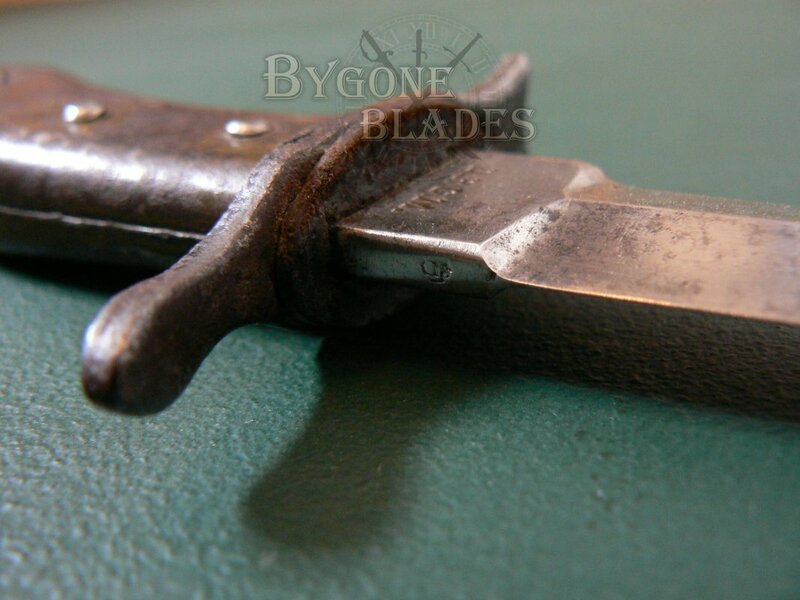 The makers mark is stamped on every blade. There are four variations of the markings dependent on the period of production. 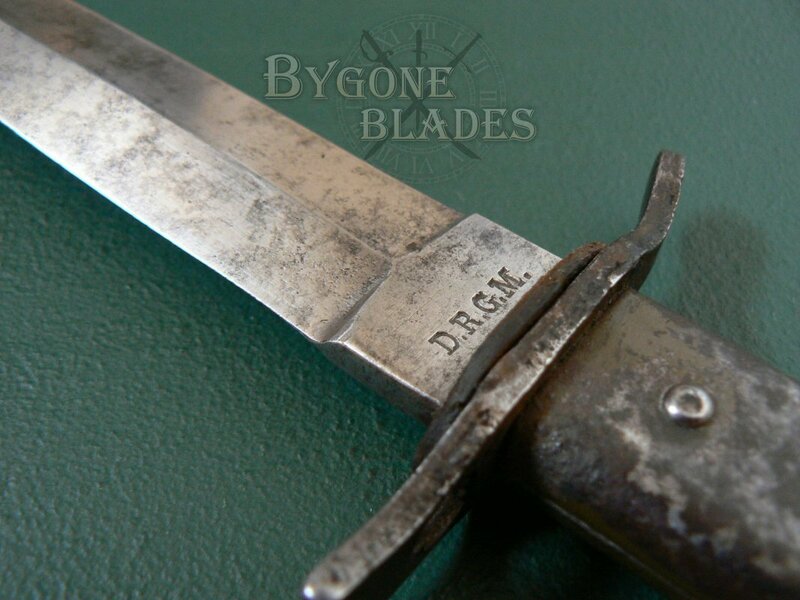 The “DRGM” stamp on the ricasso of this example, and the “DEMAG. 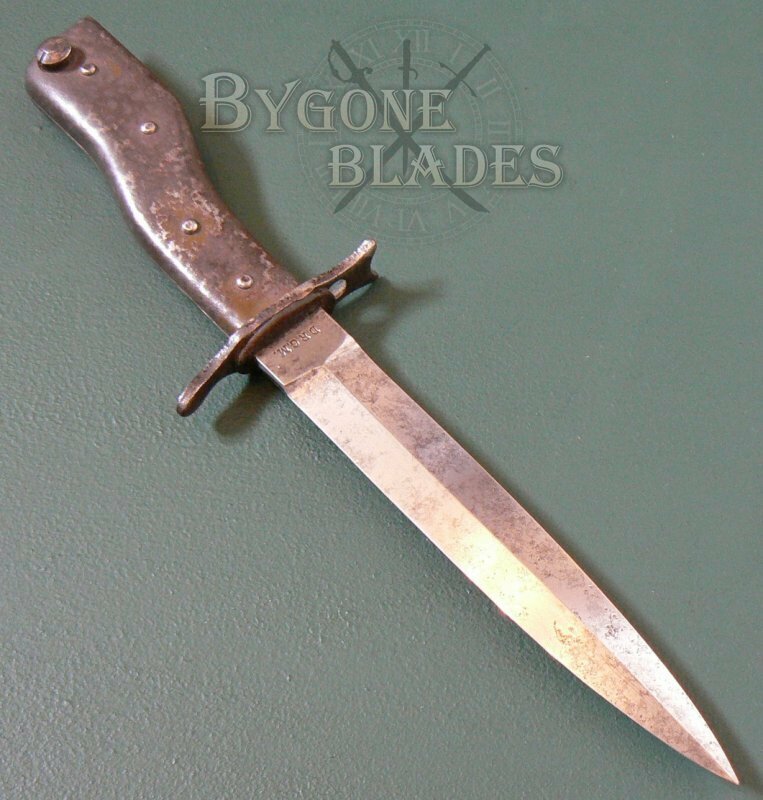 Duisburg” circle on the obverse indicate that it is one of the 1915-1916 production knives. 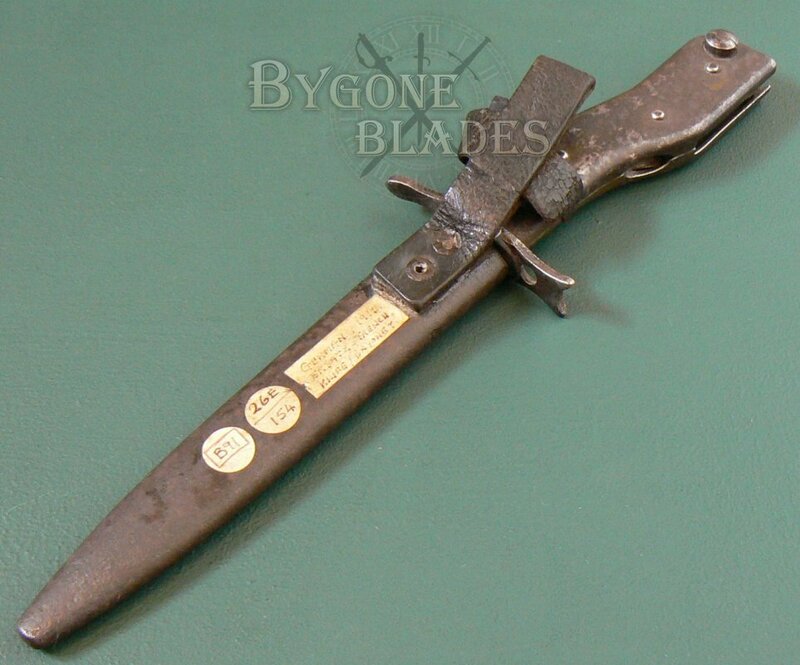 This bayonet came from the sale of a closed militaria museum and retains its catalogue labels, which date it to 1916. 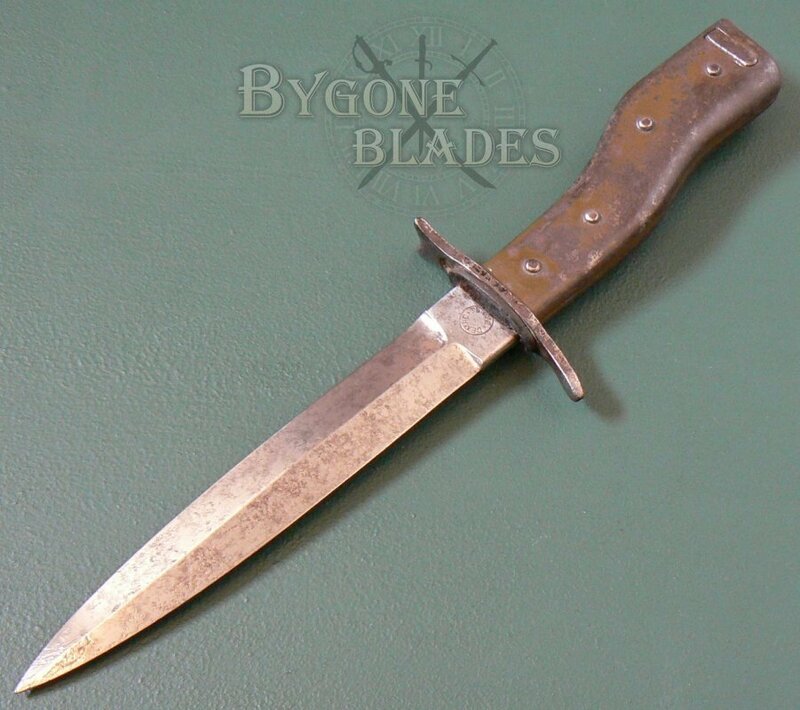 Designed to fit the G98 rifle the bayonet has a very distinctive handle shape, earning it its “Crank Handle” nickname. 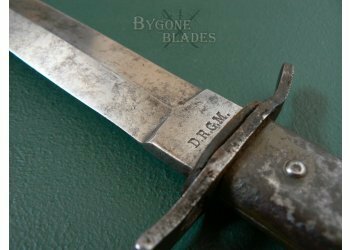 The 148mm double-edged blade is in good condition with a mild speckled patina. 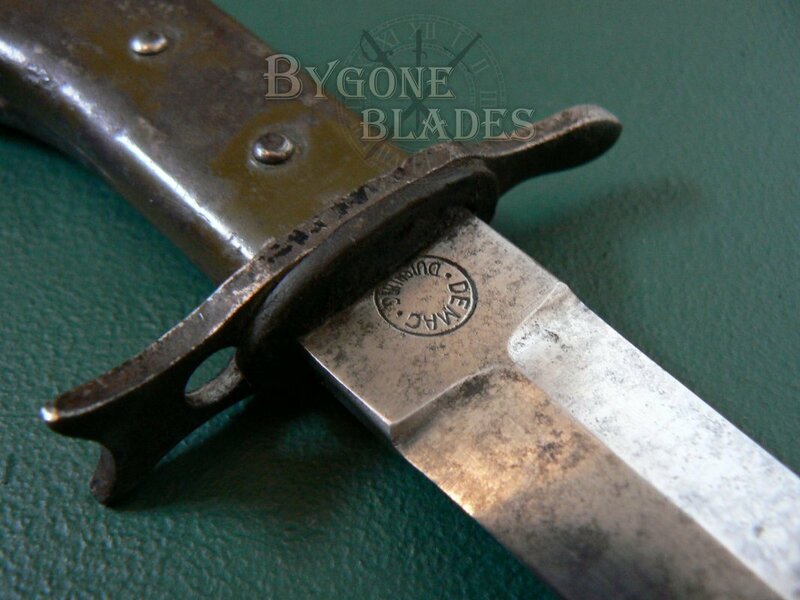 The blade is stamped on both sides of the ricasso with the maker’s logo and the spine bears an inspection mark or waffenampt. 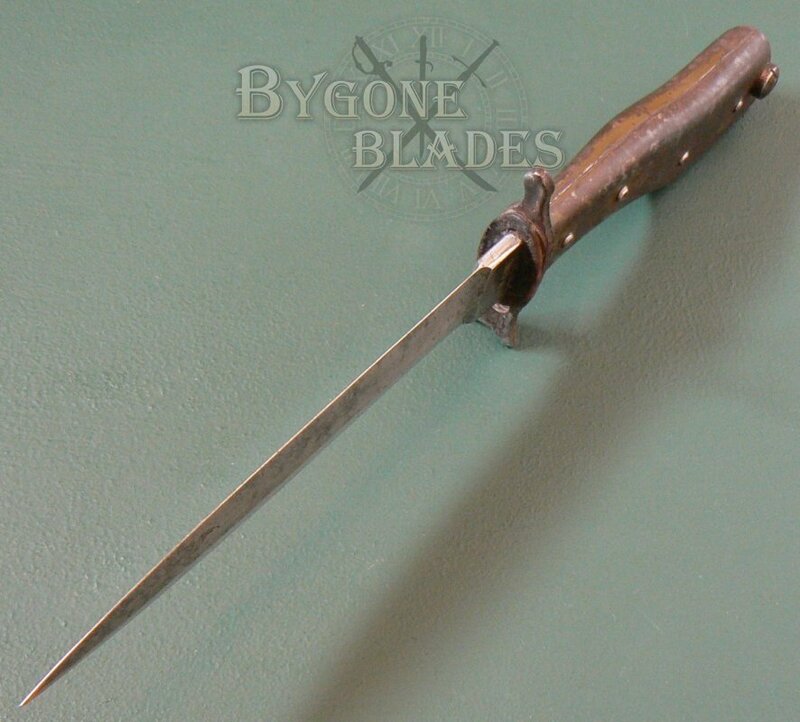 The blade retains its original leather washer. 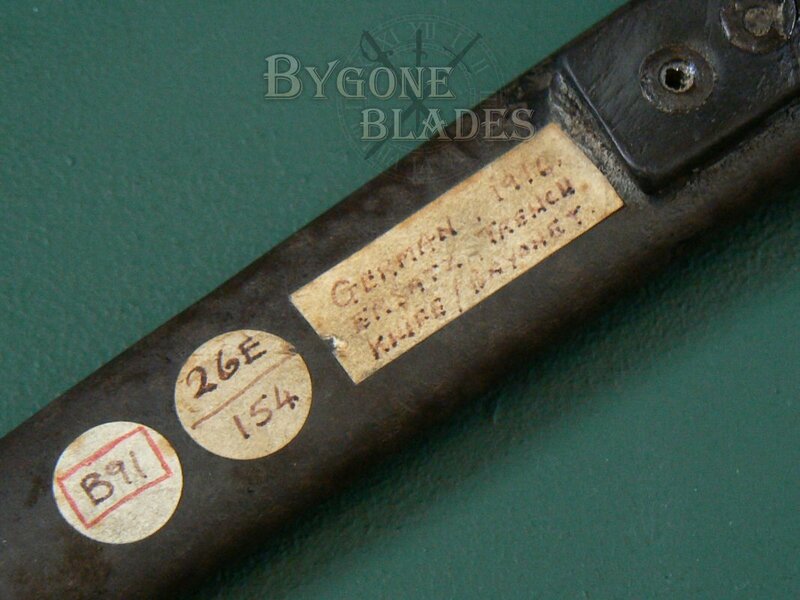 The grip retains traces of its original feld grau paint and the spring locking mechanism works. 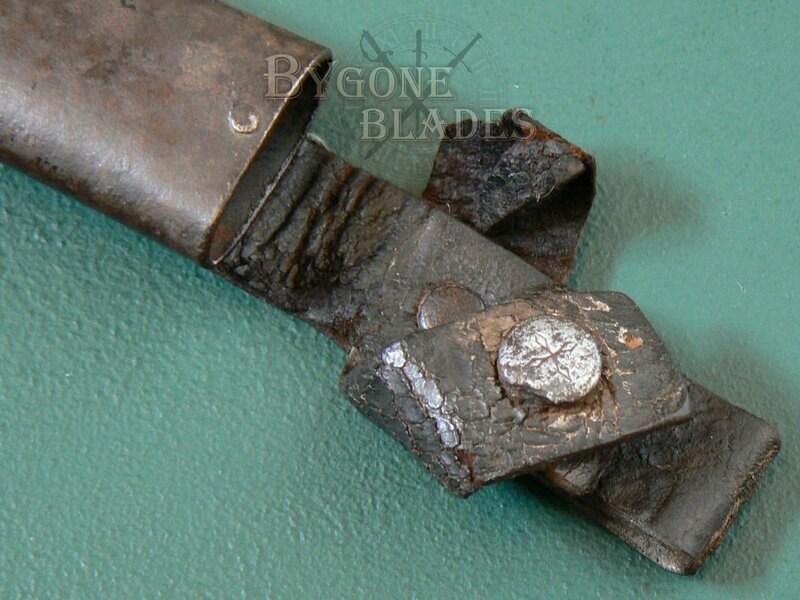 The original steel scabbard retains the leather belt loop with snowflake press-stud although the retaining loop itself is damaged. 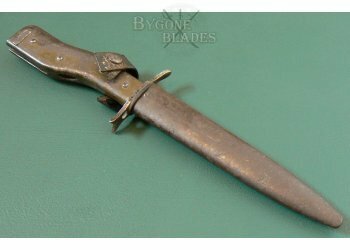 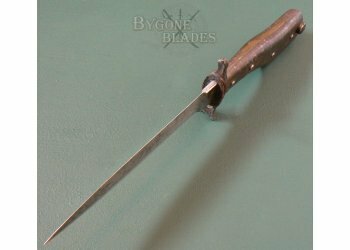 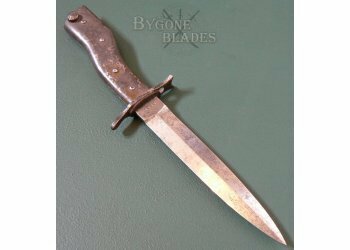 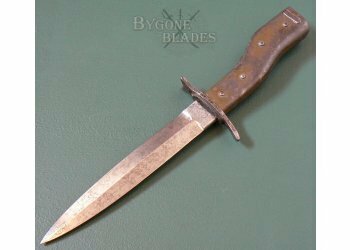 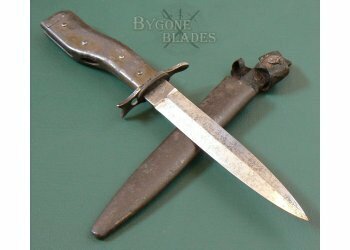 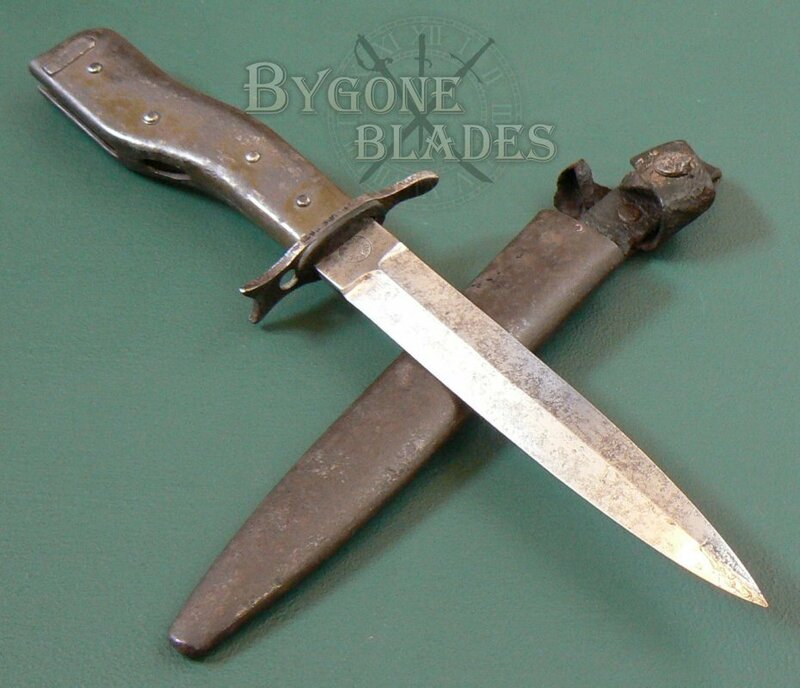 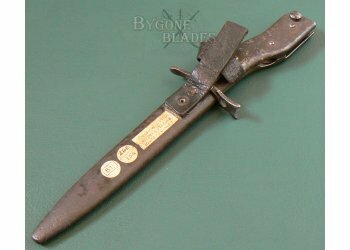 This is a rare and sought after early production model of the iconic German World War One trench knife bayonet. 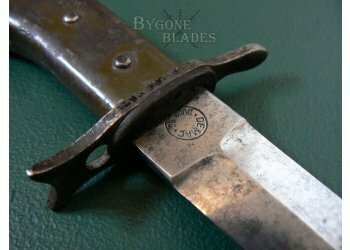 There are many fakes of this sought after knife but only the originals have peened rivets in the grip and are marked on the spine with an inspection stamp (the leather retaining strap – when present, has a “snowflake” style pattern on the press stud). 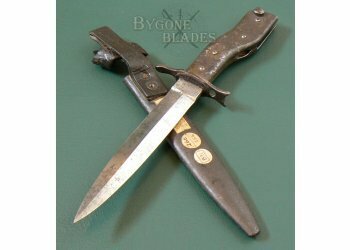 These are missing on the fakes. There are numerous other differences between the real and fake models, such as blade and crosspiece thickness but the above pointers are easily spotted without the need for callipers.